© 2014 by The York Daily Record/Sunday News. 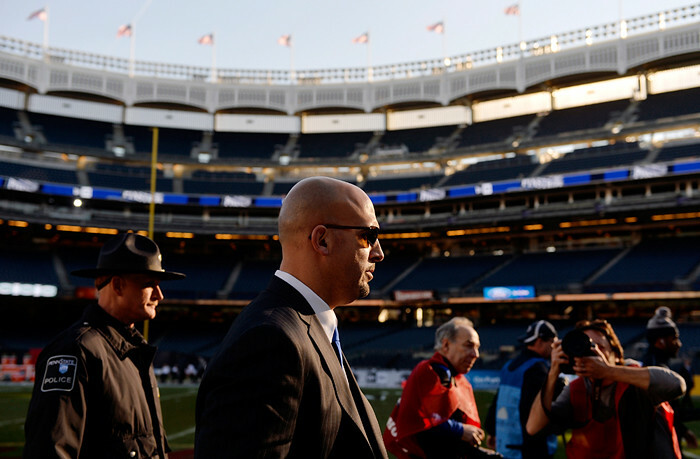 Penn State players enter the field from the first-base dugout for warmups before the New Era Pinstripe Bowl game on Saturday, Dec. 27, 2014, at Yankee Stadium. One does not simply cover a bowl game. At least, not if you’re The York Daily Record. © 2014 by The York Daily Record/Sunday News. 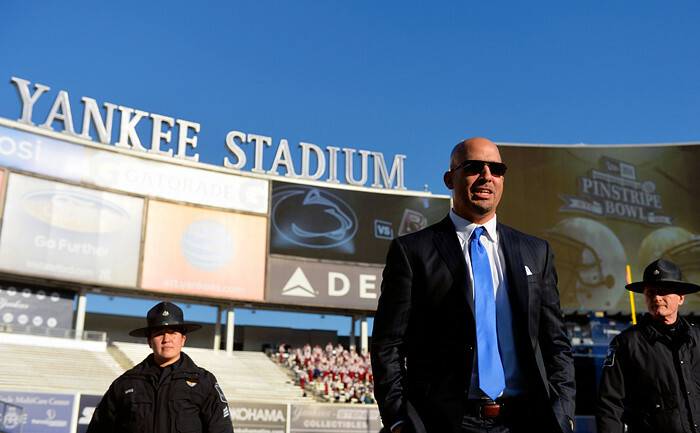 Penn State head football coach James Franklin tours the field at Yankee Stadium ahead of the New Era Pinstripe Bowl game on Saturday, Dec. 27, 2014. It’s Penn State’s first bowl game in three seasons, following the NCAA’s lifting the sanctions enacted after the Sandusky scandal erupted, so this game is important for the players and the fans. It’s in New York City, which is weird because bowl games are usually played in nice, warm places, but New York is also iconic, so pictures of Penn Staters — who usually tailgate in the rolling hills of rural, central Pennsylvania — wandering or partying in the concrete jungle are paramount. It’s my first bowl game to cover for the paper, so it’s crucial I’m on my A-game. To be fair, the third point was never actually uttered, but it stood. © 2014 by The York Daily Record/Sunday News. 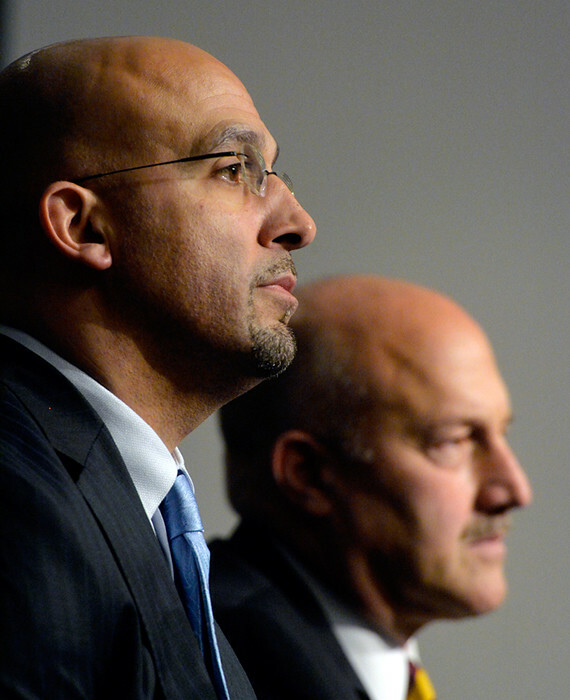 Penn State head football coach James Franklin and Boston College coach Steve Addazio listen to a question at a coaches’ press conference at Yankee Stadium on Friday, Dec. 26, 2014. 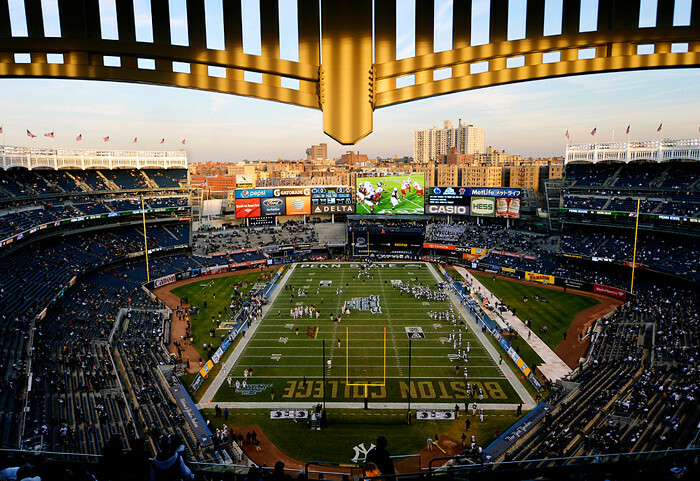 Penn State plays Boston College tomorrow in the New Era Pinstripe Bowl Bowl in Yankee Stadium. So, the day after Christmas, writers Frank and Lizi and I boarded the Amtrak to Penn Station, and got to work immediately upon our arrival in Manhattan. The only chances we had for relaxation and/or exploration were in the late evenings after we finished work on Friday and Saturday, as well as Sunday morning before we departed for home. We made the most of these limited opportunities, and had a nice Roman-Jewish dinner, a hoppin’ late-night Korean dinner and a hearty Sunday brunch. © 2014 by The York Daily Record/Sunday News. 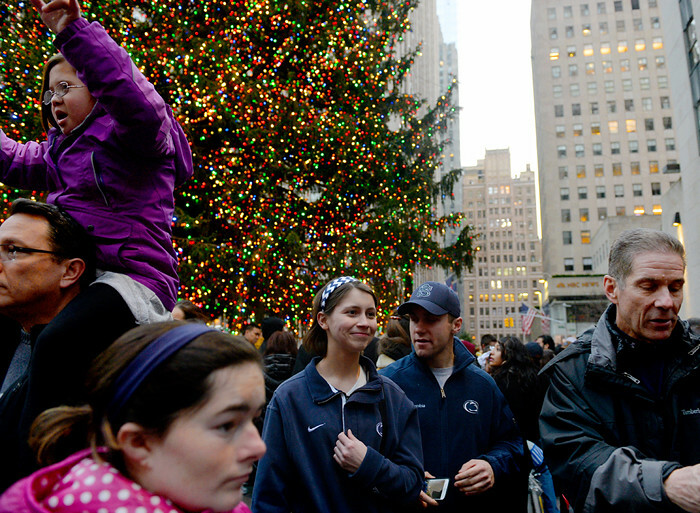 Penn State alumni Kayla Nakonechni of Scranton and John Tecce of Downington, center, stand in front of the Rockefeller Center Christmas tree for a photo on Friday, Dec. 26, 2014, in New York City. Tecce graduated in 2012, while Nakonechni just graduated in a December commencement ceremony. © 2014 by The York Daily Record/Sunday News. 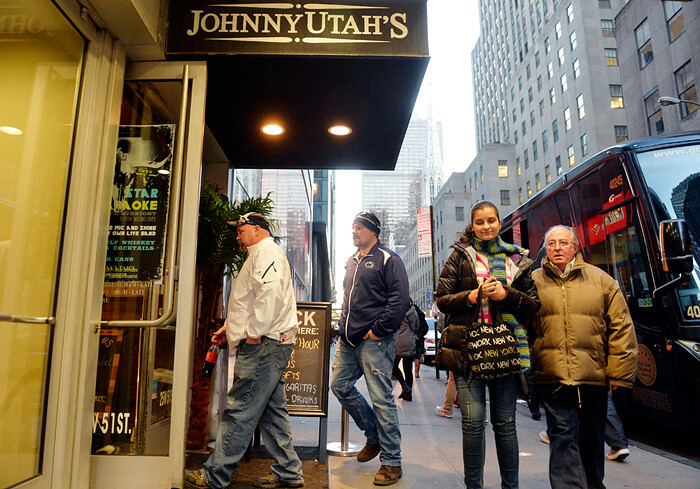 Penn State fans Scott Yorty of Bloomsburg, left, and Zach Stike of Suffolk, Va., center, walk into Johnny Utah’s for a happy hour hosted by the Nittany Lion Club and the Penn State Alumni Association on Friday, Dec. 26, 2014, in New York City. © 2014 by The York Daily Record/Sunday News. 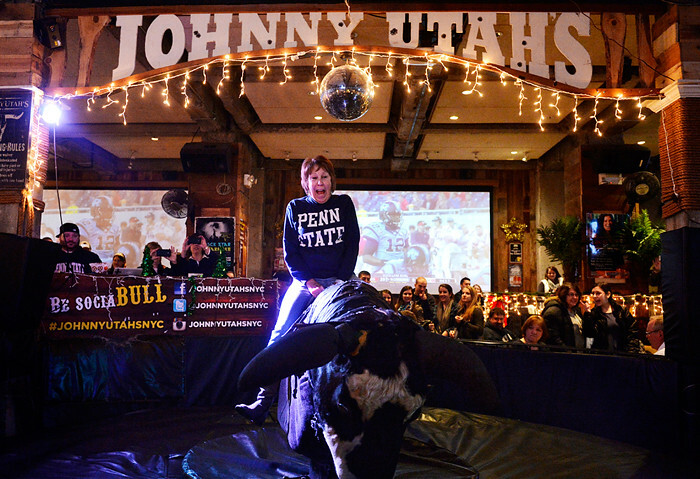 Peggy Rehill of State College is the first person to ride the mechanical bull at a happy hour hosted by the Nittany Lion Club and the Penn State Alumni Association at Johnny Utah’s in New York City on Friday, Dec. 26, 2014. © 2014 by The York Daily Record/Sunday News. 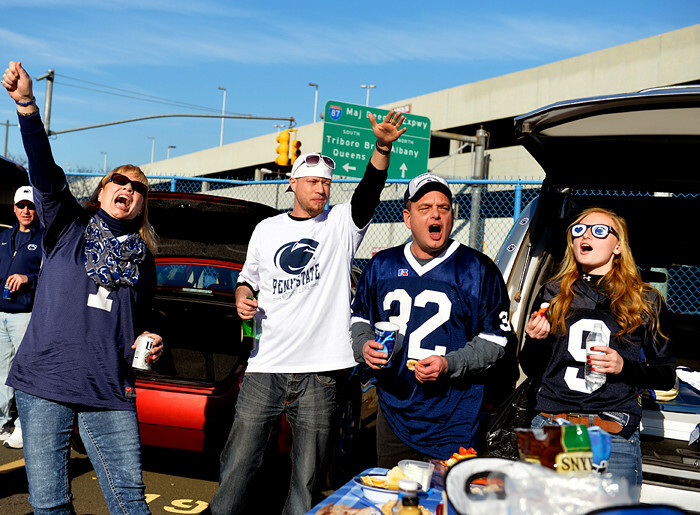 From left, Penn State fans Beth Bevan of Tunkhannock, Pa., Nathan Cartwright of Los Angeles, Calif., Bevan’s husband Bill Berholtz and Berholtz’s daughter Sarah, 15, shout the “We are” chant at their tailgate in a Bronx parking lot nearby Yankee Stadium on Saturday, Dec. 27, 2014. © 2014 by The York Daily Record/Sunday News. Penn State fan Dave Hennon of Pittsburgh checks his phone outside Stan’s Sports Bar on River Avenue toward Yankee Stadium on Saturday, Dec. 27, 2014. © 2014 by The York Daily Record/Sunday News. 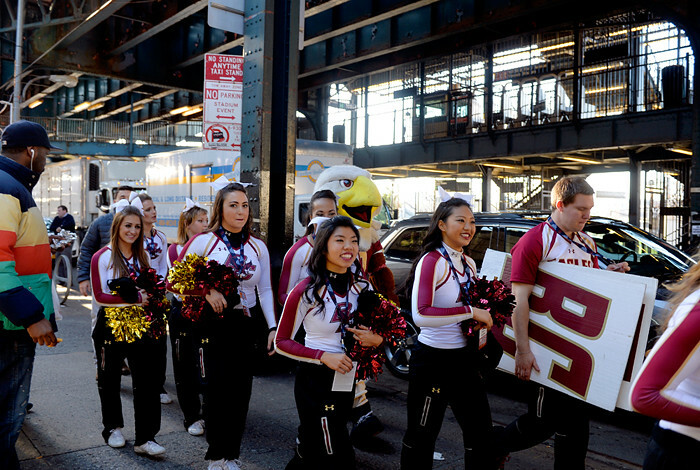 Boston College cheerleaders walk down River Avenue toward Yankee Stadium on Saturday, Dec. 27, 2014. © 2014 by The York Daily Record/Sunday news. 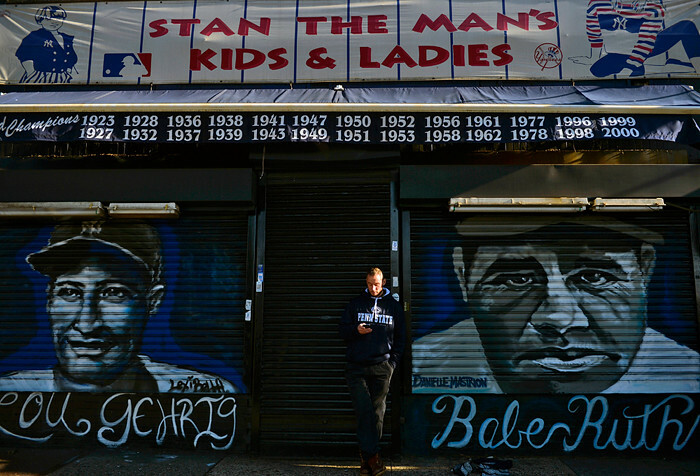 A portrait of New York Yankee legends Lou Gehrig and Babe Ruth hangs on a wall behind Penn State cheerleaders as they rally up a crowd inside Yankee Stadium before the team’s arrival on Saturday, Dec. 27, 2014. © 2014 by The York Daily Record/Sunday News. 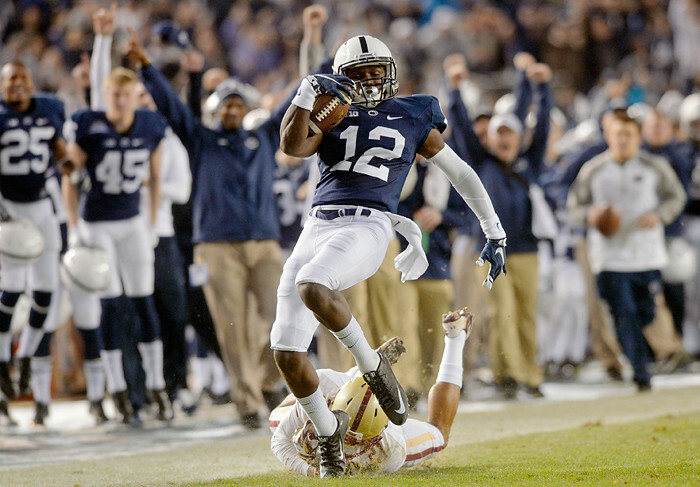 Penn State wide receiver Chris Godwin escapes a tackle by Boston College’s Manuel Asprilla in the first half of the New Era Pinstripe Bowl game on Saturday, Dec. 27, 2014, at Yankee Stadium.